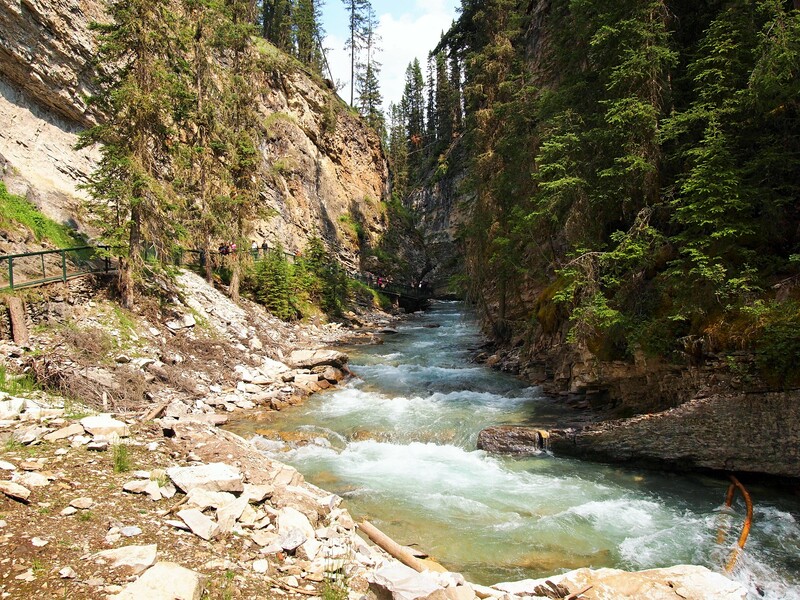 We got up the next morning and packed up to leave Kananaskis Country. We didn’t leave until around 9am which was probably later than we should have left. We had a LONG day ahead of us. 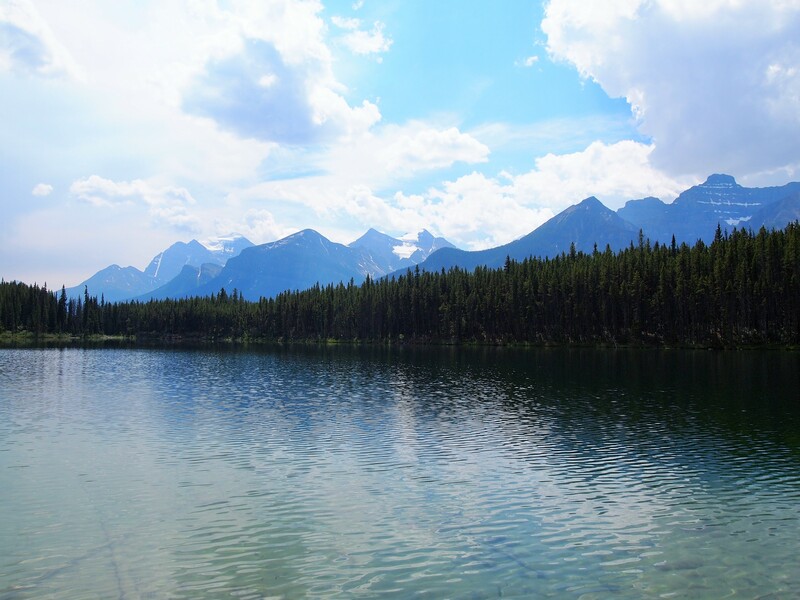 Our destination was the Wabasso Campground in Jasper National Park, 396 kilometers (229 miles) away. To get there we were going to drive through Banff National Park for the first time, and I wanted to be able to stop at any and all points of interest along the way. We left Kananaskis without breakfast, so our first priority was coffee and food (and wifi…) in Banff. 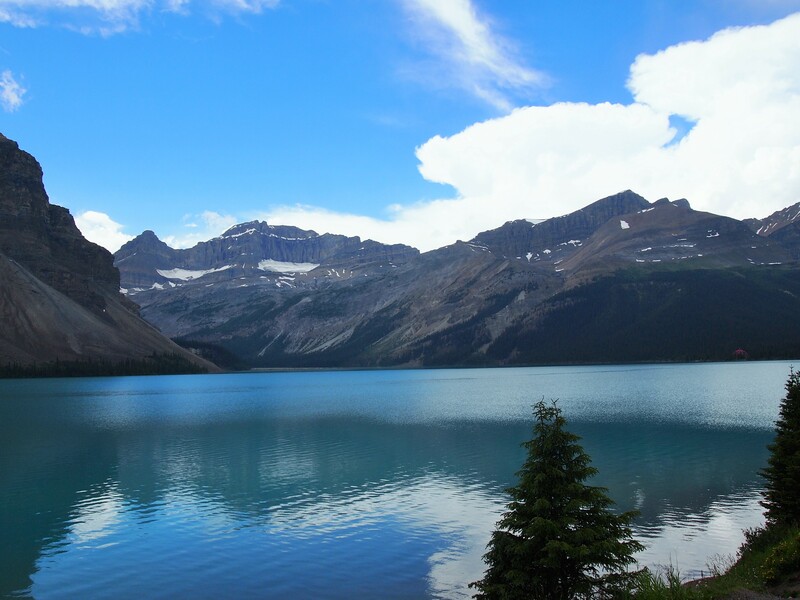 Like the town of Waterton, Banff is located inside the boundary of the national park. We found a parking spot a block from Banff Avenue fairly easily and walked to Wild Flour, a nearby bakery. It was a popular place and slightly overwhelming after our relative seclusion. We hung out for a little while, checking in with our parents and friends, looking up the weather forecast, and preparing for the day ahead. Sadly, the weather forecast didn’t seem to be in our favor, but we were also driving a wildly long distance, so it was hard to tell what it would really be like. 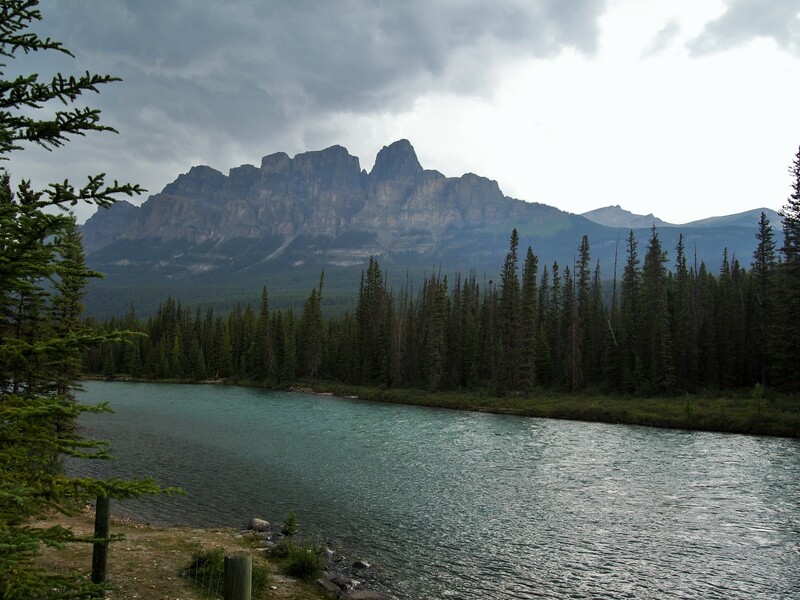 Rain was forecast in Jasper for the entirety of our stay which certainly dampened (hah!) my mood. We walked down Banff Avenue, the main boulevard, and stopped in a shop so I could buy a kitschy shirt for my collection. 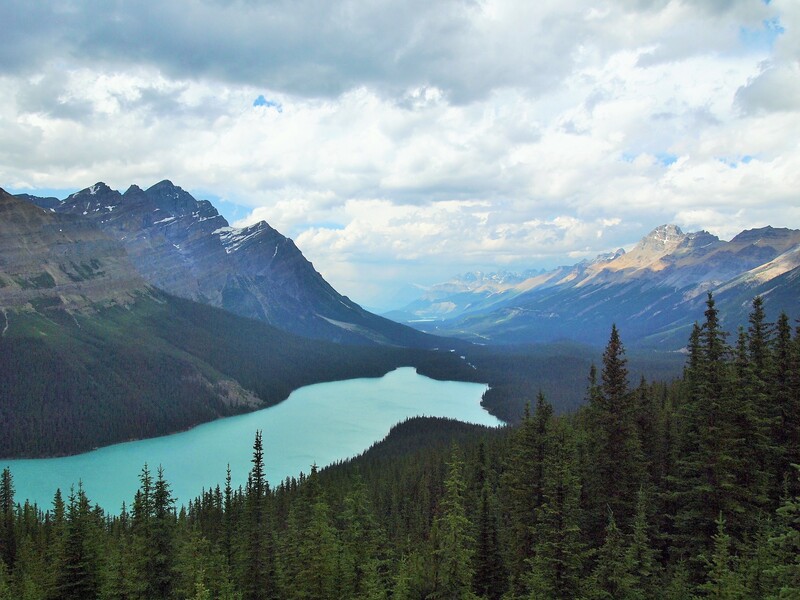 Banff felt a little out of our comfort zone; we’re more at ease in laid-back, off-the-tourist-path type places and Banff is definitely the opposite. 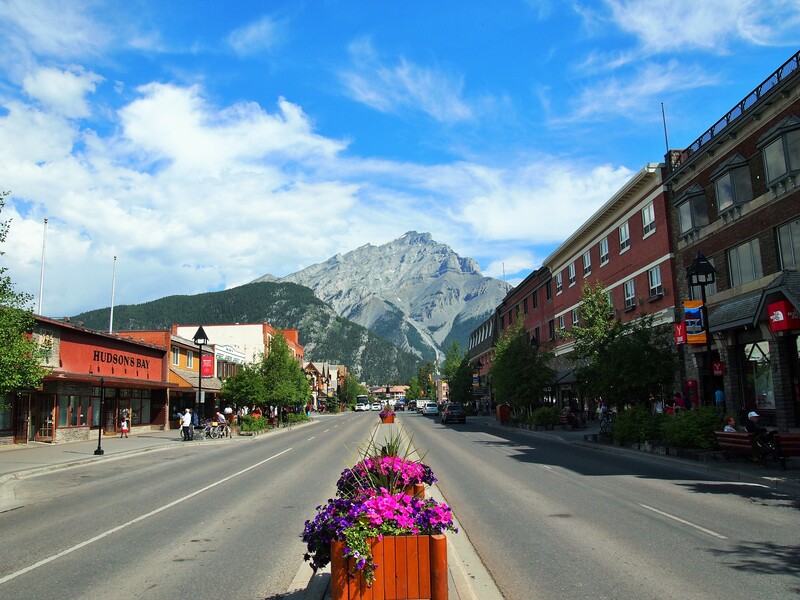 We also didn’t plan to spend much time in Banff, so we didn’t have the opportunity to see the more interesting places in town. It would be fun to go back another time (maybe not during the peak tourist season) when we plan to spend more time in the area. We left Banff to begin our driving tour of the park. 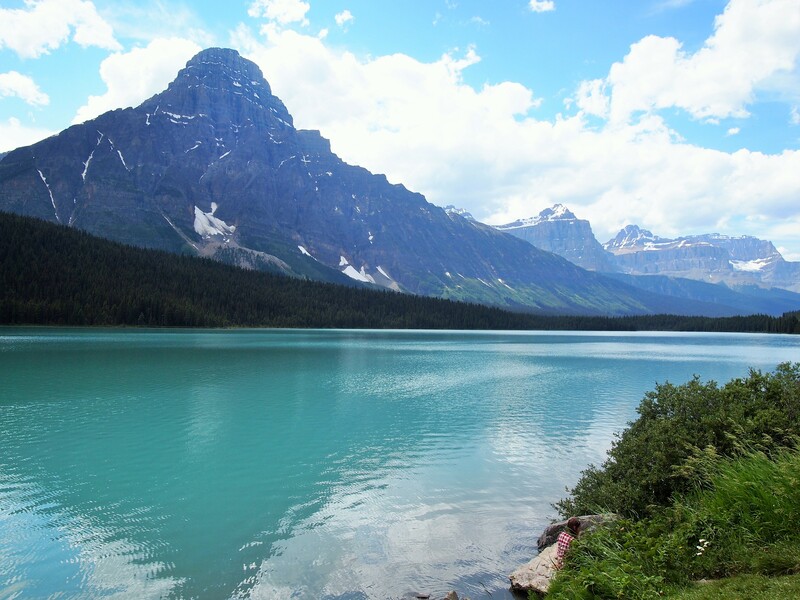 Shortly after leaving the town, we exited for the Bow Valley Parkway which runs parallel to the Trans-Canada Highway for 32 miles toward Lake Louise. It felt quiet, and I was surprised to see little other traffic on the road – well, until I looked behind us! 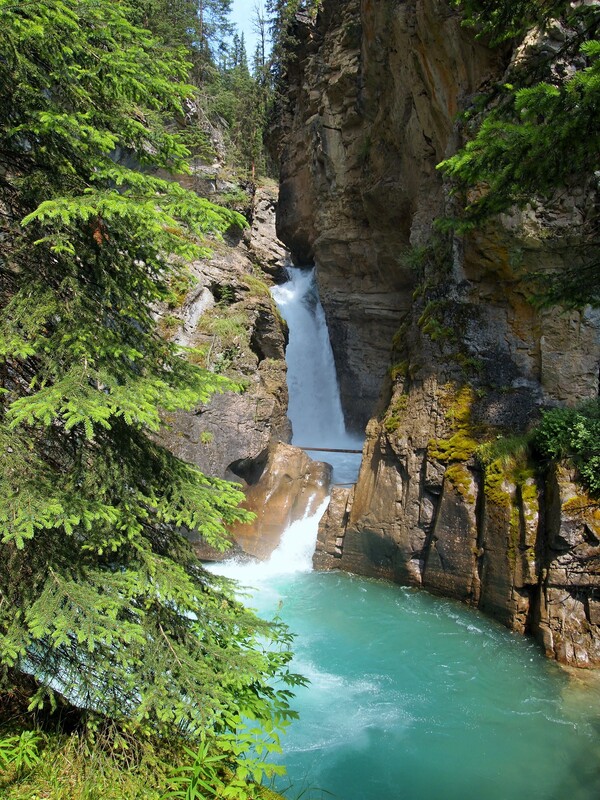 Our first stop was the immensely popular, Johnston Canyon. Cars lined the roadway and the parking lots were at capacity. 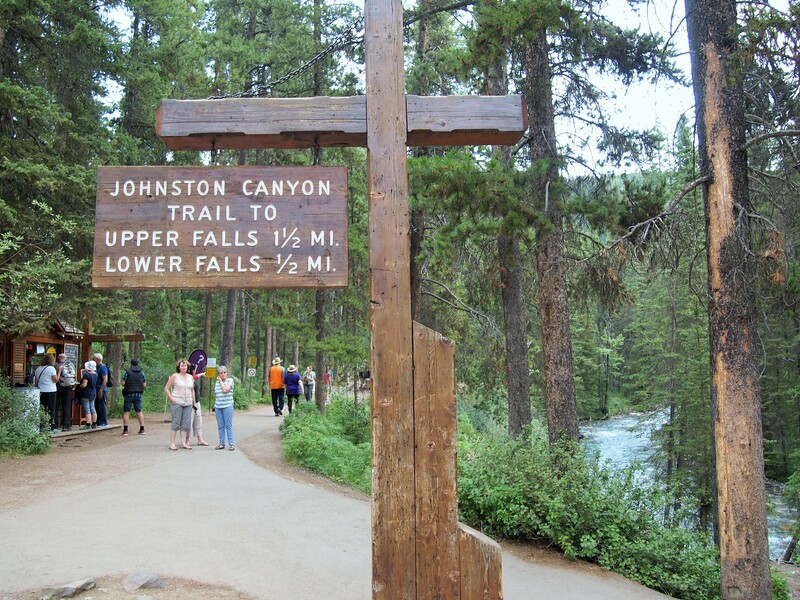 We managed to find a nearby spot on the road, and scurried out to quickly walk the path to the lower falls. We knew it would be crowded, but we were able to navigate around slower groups pretty easily. 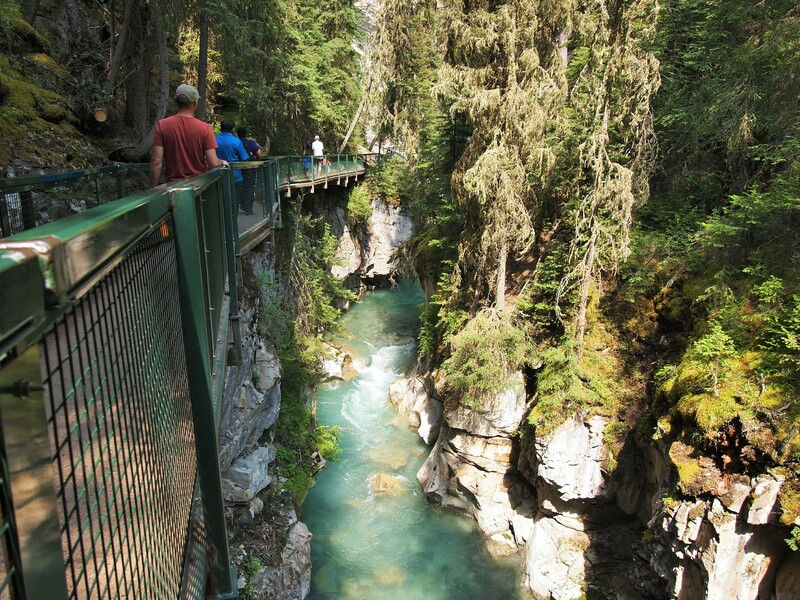 The path begins alongside Johnston Creek and then narrows onto a catwalk to bring visitors into the depths of the canyon. It was a pleasant walk. The canyon is 100 ft. at its deepest point, but it felt more spectacular since we were in the canyon itself. 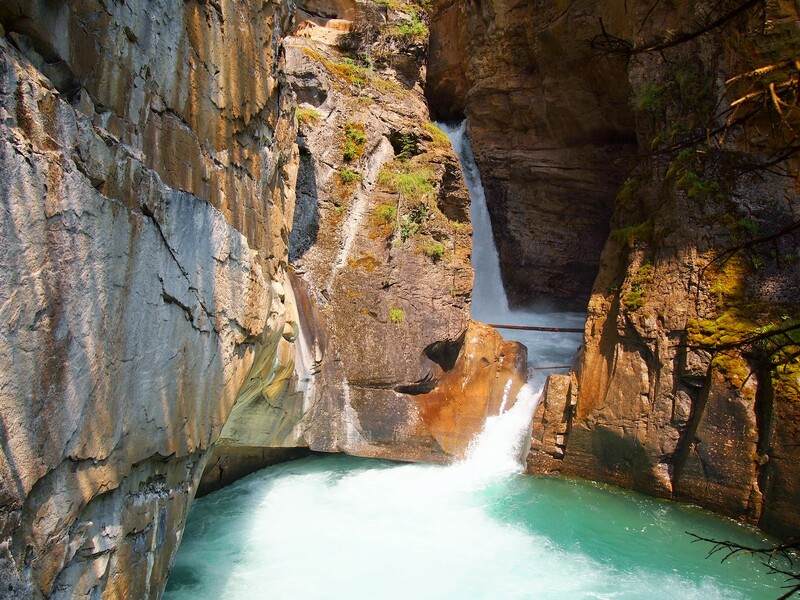 The falls weren’t anything special – we’ve seen better waterfalls – but it was worth the short walk to the end. The weather began to shift as we walked back to our car and soon a dark sky brought thunder, lightning, and rain to our scenic drive. We re-joined the Trans-Canada Highway at Castle Mountain and by-passed Lake Louise (we would visit on our return from Jasper). The downpour was brief; by the time we reached our next stop it was over, and we had hope for a mostly sunny passage. 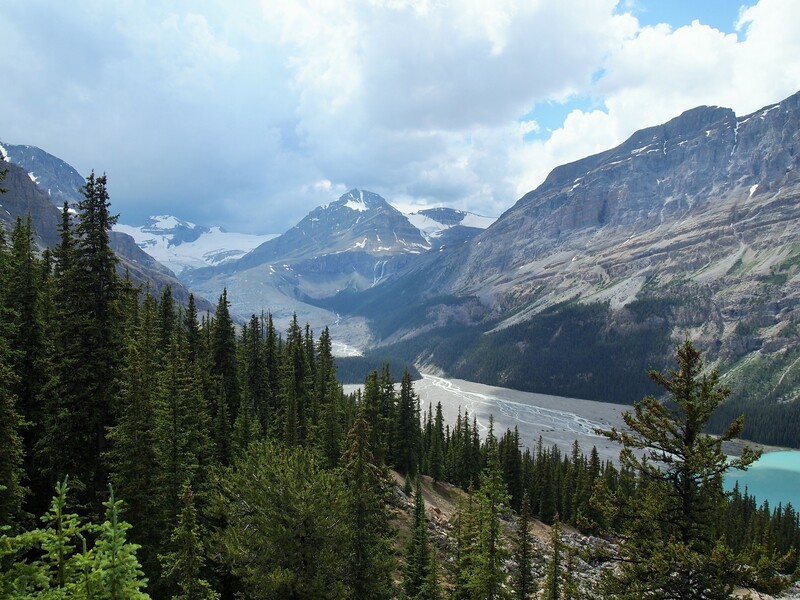 The Trans-Canada Highway diverted west and we continued north on the Icefields Parkway, a 143 mile stretch of road which runs from Lake Louise to Jasper following the Continental Divide and an impressive line of mountains. We got out at many of the scenic overlooks, each time stunned by the scenery. 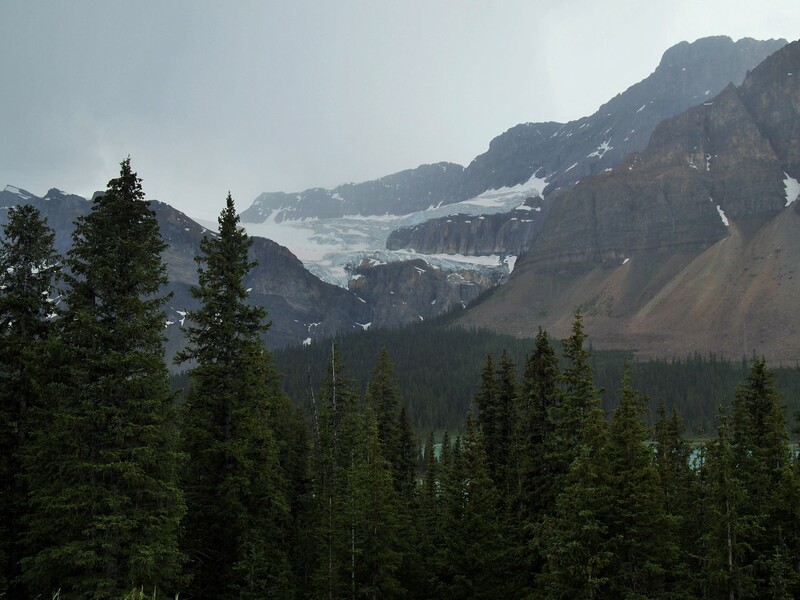 We constantly gawked at the glaciers clinging to the sides of various mountains. It was gorgeous, even in the less-than-stellar weather. 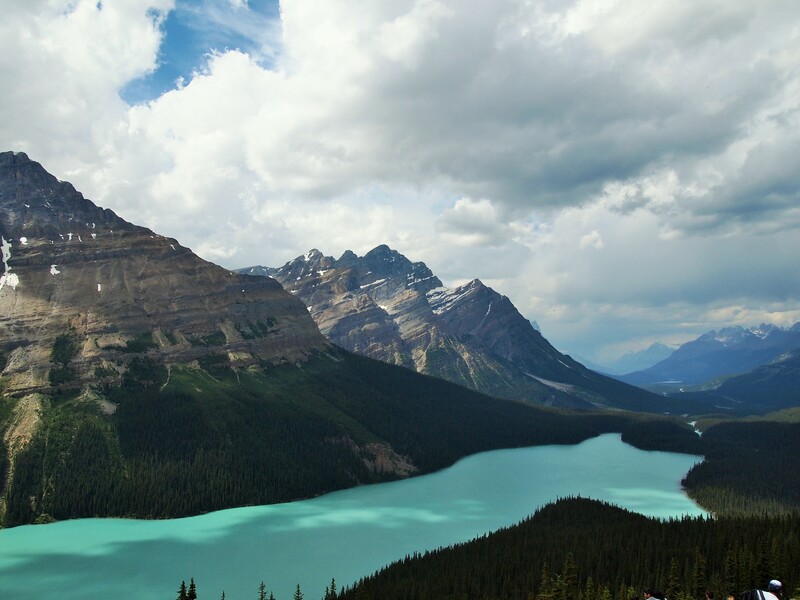 We were fortunate to avoid any showers at Peyto Lake even though thunder rumbled in the distance. 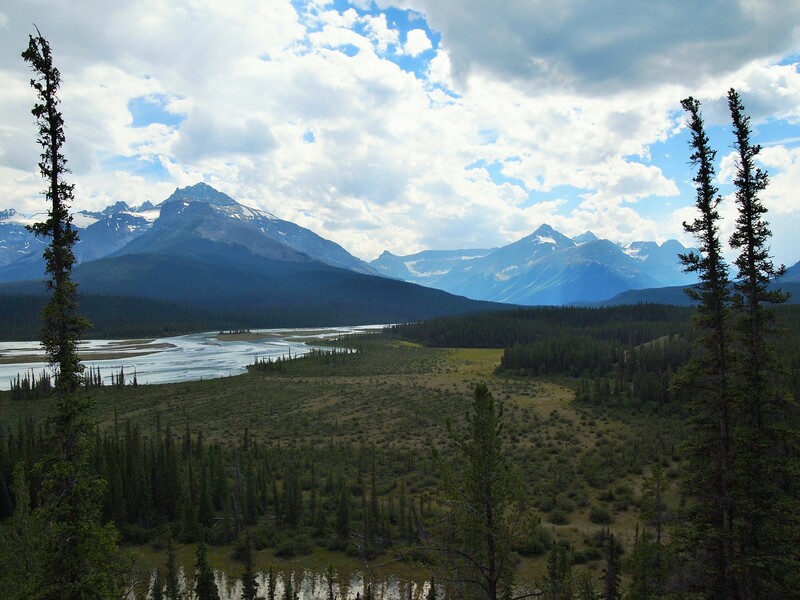 Once we climbed Sunwapta Pass and crossed the boundary into Jasper National Park, we were exhausted and ready to get to our campground/go into Jasper for a beer. We knew we’d be driving back down the parkway, so we crossed our fingers and hoped for decent weather on our return.